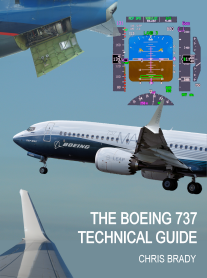 The Boeing 737 Technical Guide - Technical guide to the 737 based upon this website. 370 pages, over 500 photographs. Covering systems, external items, history, quiz, pilots notes, airtesting, accident reports & more. Leading Edge Libraries - Bill Bulfer's 737 excellent Cockpit Companion and FMC Guides. Boeing 737 Management Reference Guide - Pat Boone's book describing in-depth all non-normal procedures and their causes and fixes. Sjap.nl - Forum for maintenance technicians who work with 737's. Southwest Airlines Technical Training - Engineering training courses from those who know the 737 best. 737 Family Overview from Boeing.